As we move from the centenary of the ending of the First World War in 2018 towards the 80th anniversary of the start of the Second World War in 2019, now is a particularly poignant time to remember all those who served during those two wars and especially those who paid with their lives. It is a sad fact that throughout history discord and strife between groups or nations has so often resulted in open hostility. Since St Disen’s Church was first built in the Middle Ages, Britain has been embroiled in many wars both at home and abroad including the Wars of the Roses, the English Civil War, the American War of Independence, the Napoleonic Wars, the Crimean War, the Boer War, the First and Second World Wars and the Korean War. 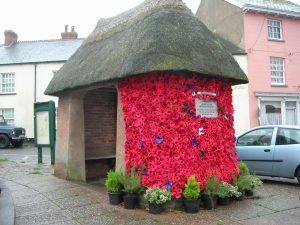 Although Bradninch itself has, fortunately, been far removed from the battlegrounds, its townsfolk have been embroiled in the conflicts and many have paid the ultimate price. 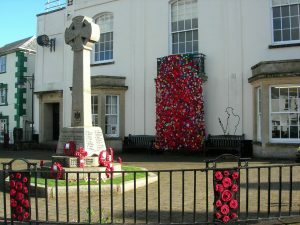 Our earliest war memorial is tucked next to the children’s corner on the north side of the church. 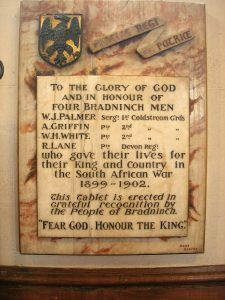 It commemorates four Bradninch men who died in the war in South Africa between 1899 and 1902. Above the memorial, the larger of the two Stars and Stripes commemorates the bicentenary of American Independence in 1976 when it was flown above the Capitol Building in Washington. A copy of a letter signed by Gerald Ford, president at the time, is framed below. The First World War (1914-1918) had a huge impact on local communities. The loss of three quarters of a million British lives coupled with the official policy of not repatriating the dead led to the erection of thousands of war memorials across the country. In St Disens, the chapel on the south side of the chancel was restored and rededicated to St George as a memorial to the men from Bradninch and Hele who died in the war. Work on the chapel began in 1917, undertaken by church restorers, Herbert Read Ltd. 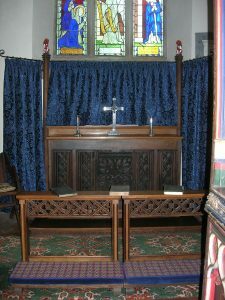 The medieval painted screen, which originally stood on the other side of the chancel and was moved to under the tower arch in 1841, was moved again to form the north side of the chapel. One of its painted panels shows St George slaying the Dragon. The altar was restored, using panels from Quimper Cathedral in France and set on a wooden plinth inscribed ‘To the glory of God. In memory of loved ones departed’. 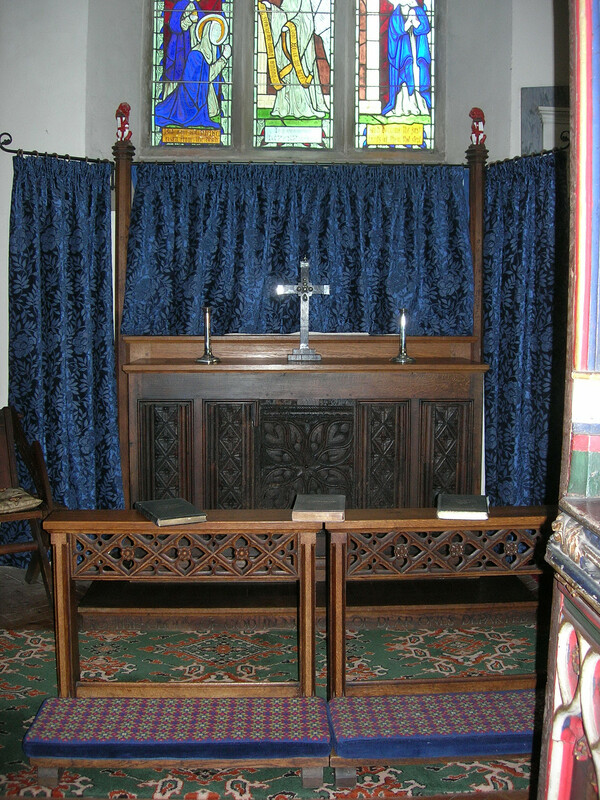 The chapel together with its new fittings and specially presented gifts including an altar cross of bog oak and silver, candlesticks, book rest and two kneelers (one of which we still use regularly at Sunday morning communion services) were dedicated by the then Bishop of Crediton at a special service in September 1917. 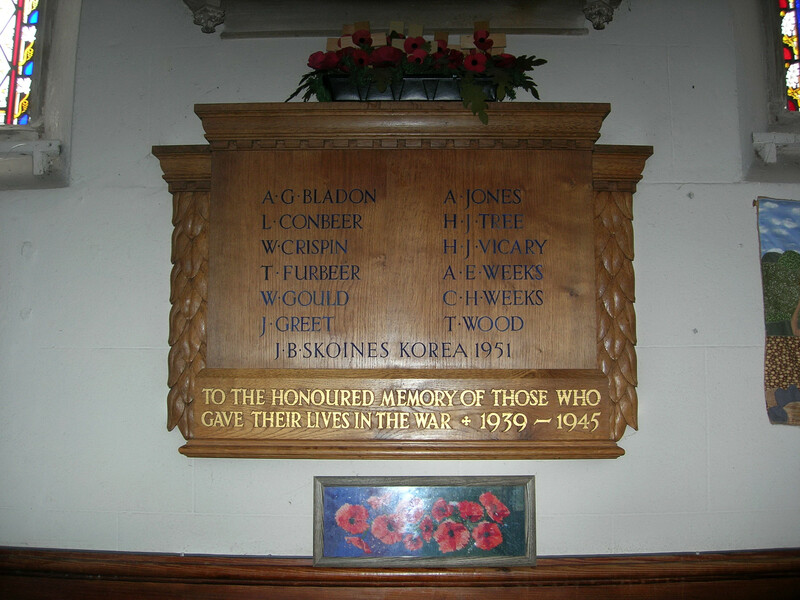 The memorial tablet bearing the names of the fallen was, as an article in The Western Times explains, not provided until the end of the war, which at the time of the dedication service was not known. 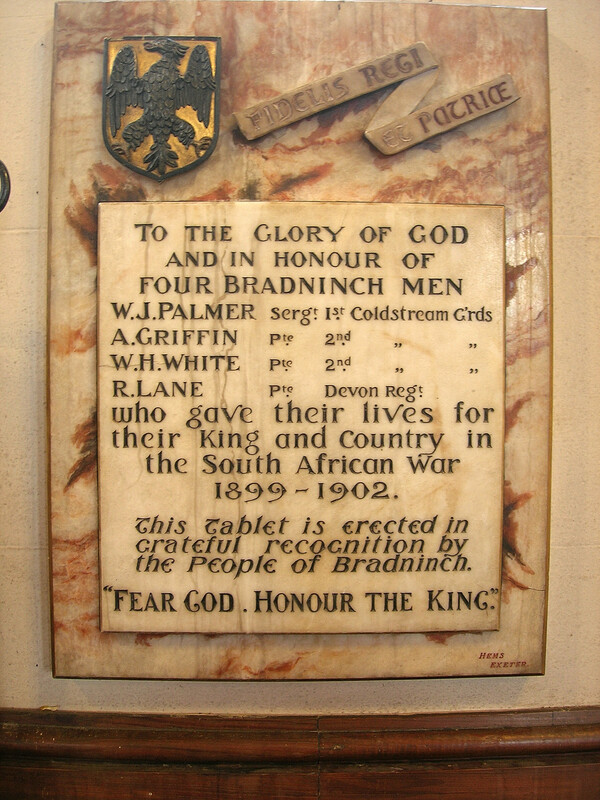 The tablet was duly set up in 1919, inscribed with the names of 52 men who ‘laid down their lives for King and Country’. 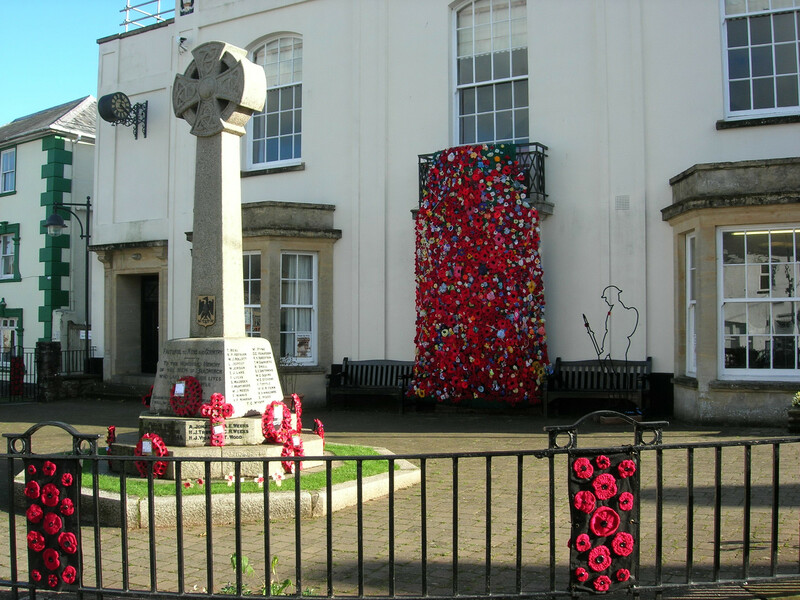 Bradninch’s main war memorial, now Grade II listed, stands outside the Guildhall and it is here that we gather at the eleventh hour on Remembrance Sunday before making our way to one of the town’s three churches for a Service of Remembrance. The memorial, which was unveiled in 1920, comprises a tall Celtic style wheel-head cross in Dartmoor granite on a plinth and three-stepped octagonal base. The dedicatory inscription and commemorated names of the fallen of the First World War are on the plinth. The photo shows the memorial as it was in 1940. The names of 13 men who gave their lives in the Second World War and Korean War were added later. The idealistic aspiration that the First World War was to be the war to end all wars was short-lived. On 3rd September 1939, then Prime Minister Neville Chamberlain announced that, following the failure of Germany to withdraw its troops from Poland, ‘this country is at war with Germany’. 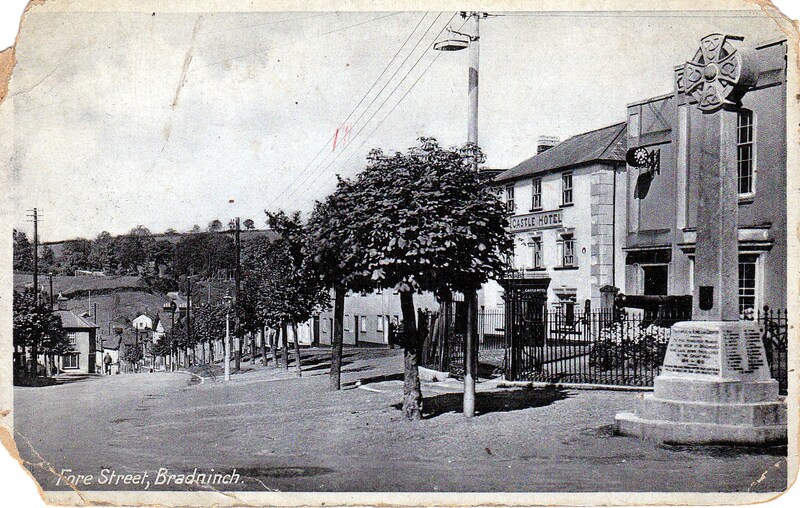 At the end of 1941, following the attack on Pearl Harbour the United States entered the war, which was brought much closer to Bradninch in 1943 when the US Army 955th Field Artillery Battalion were stationed here. The officers were billeted around the town but the ordinary troops were located in a Nissen hut camp erected on the cricket pitch. The camp, which was subsequently used for Italian prisoners of war, was demolished in 1947. The American soldiers generally attended the Baptist Church. As a mark of their appreciation they sent a collection made in France or Germany in the winter of 1944 which the church used to purchase a lovely Bible, described in a contemporary newspaper article as a ‘permanent memorial to an Anglo-American comradeship formed during the war’. 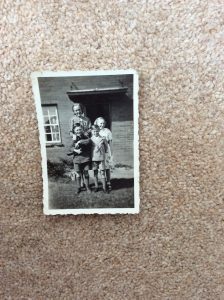 Bradninch also became home to a number of evacuees including Jack Saunders who, together with his sister and brother, stayed firstly with the Kensal family and then with the Skoines. The care given them in ‘those bad days’ is one of Jack’s abiding memories. Jack used to attend St Disen’s Church and was presented with a bible and hymn book. 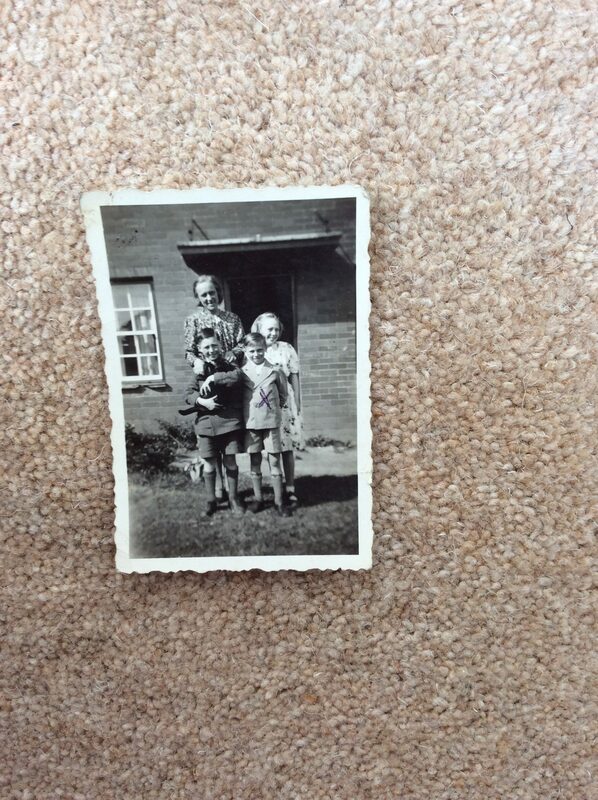 The photo shows Jack with some of the Skoines family including John Skoines (on left) who was killed in Korea in 1951. Back in St Disen’s Church, on the south wall of the nave is a wooden memorial commemorating the 12 men from Bradninch who died in the Second World War. A faculty for this was issued in 1950 but by the time the memorial was erected, a 13th name had been added, that John Skoines, mentioned above. 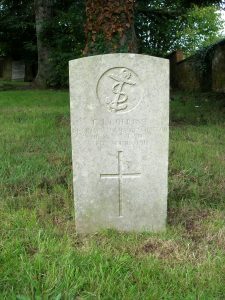 St Disen’s is also home to eight war graves, indicated by a small plaque on the railings by the main gateway into the churchyard. The plaque was set up by the Commonwealth War Graves Commission in 2018 as part of their project on the centenary of the First World War, to increase awareness of the fact that there are war graves in the United Kingdom as well as abroad. 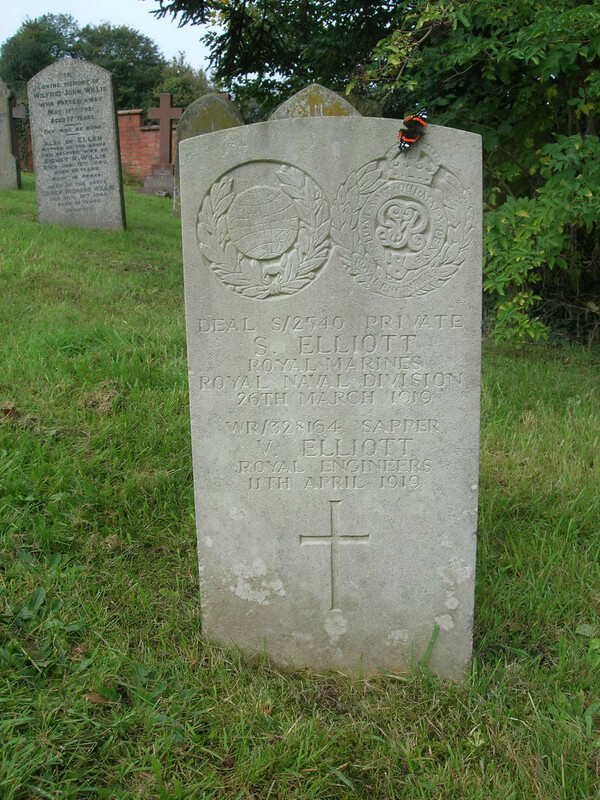 There are, however, only seven grave sites in the churchyard as brothers, Sapper V. Elliot (d.1918) and Private S. Elliott (d.1919) are commemorated together. 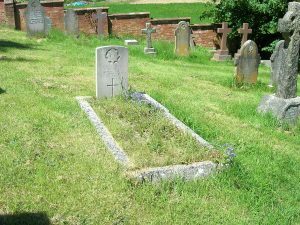 The other graves commemorate Private E. Wood (d.1918), Ordinary Seaman Frederick James Collins (d. 1918), Officer’s Steward 3rd Class E. F. Bryant (d.1918), Corporal Walter William Snell (d.1920), Arthur Gordon Bladon, craftsman (d.1944)and Flight Lieutenant Alan Leslie Stooke Hallett (d.1946). 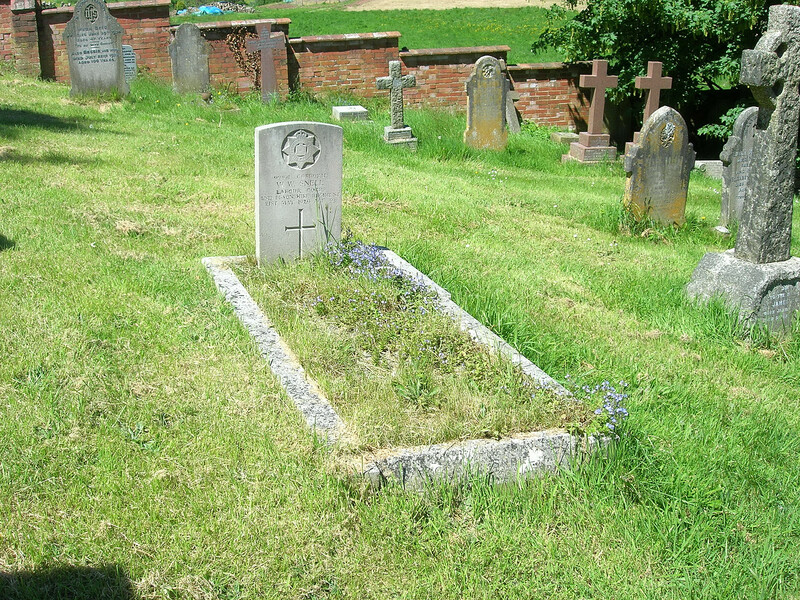 A ninth war grave, that of Private F. J. Vicary who died in 1920, lies in the graveyard at the Baptist Church. 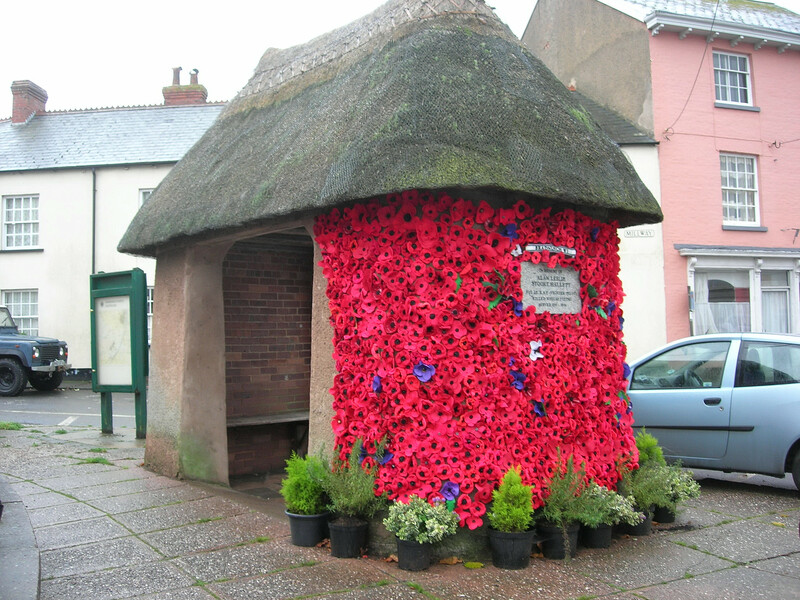 Flight Lieutenant Alan Leslie Stooke Hallett is also commemorated on a rather unusual memorial by the Guildhall – the thatched bus shelter. Stooke Hallet was an RAF fighter pilot who, in a cruel twist of fate, was killed in an air collision at Andover in 1946, while rehearsing for the Victory Day Flypast. 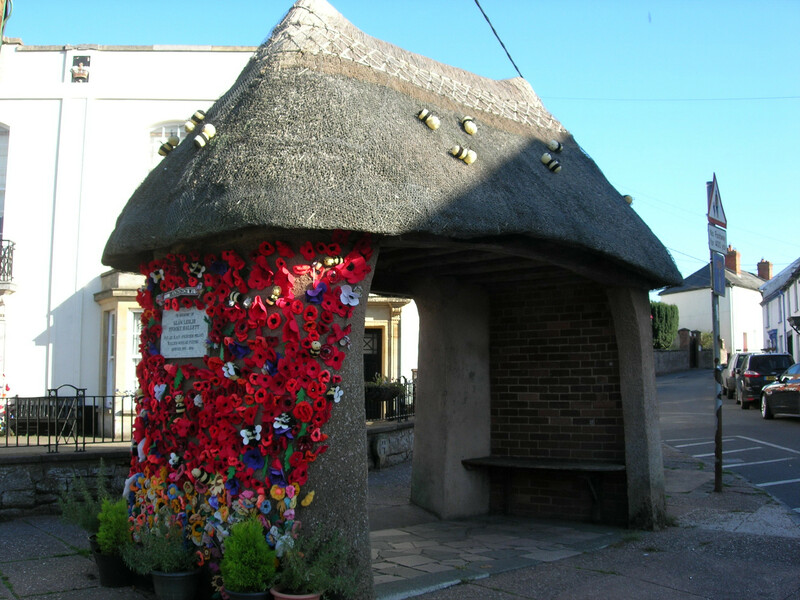 The photo shows the bus stop decorated with poppies to mark the centenary of the First World War; the purple flowers a reminder of all the animals that also served. Another poppy cascade was also hung on the front of the guildhall, behind the war memorial, where also stood the silhouette of a soldier, part of a nationwide art installation called ‘There but not there’. The poppies made by the Bradninch WI and others blossomed profusely, just as their real counterparts did on the fields of Flanders 100 years ago.